After recalling how the Synod was established by Paul VI on that date, and describing the Synod as one of the “most precious legacies of the Second Vatican Council,” Pope Francis emphasizes the “efficacious collaboration” of the Synod of Bishops with the Roman Pontiff on questions of major importance; that is, questions which “require a special knowledge and prudence for the good of the whole Church.” In an historic moment, Pope Francis says, one in which the Church is led to a new “evangelizing stage” towards “a permanent state of mission,” the Synod of Bishops is called “to become an even greater channel” for the evangelization of today’s world. Pope Paul VI had already foreseen that, with the passage of time, such an institution could be perfected. In 2006, the most recent revision of the Ordo Synodi (the regulations governing the Synod) was promulgated by Benedict XVI. In a particular way, the duties of the General Secretariat of the Synod – composed of the Secretary General and a special Council of Bishops – were established and gradually strengthened. Bishops, the Pope says, are at the same time “teachers and disciples,” in their duty, which involves their mission, but also their commitment to listening to the voice of Christ, who speaks through the People of God in such a way as to make them “infallibile in credendo,” infallible in believing. And so the Synod should also “become ever more a privileged instrument of listening to the People of God.” It does so by consulting with faithful of the particular churches; because, the Pope says, while the Synod is an essentially episcopal institution, it is nonetheless true that it cannot exist “separated from the rest of the faithful.” It is “an instrument suited to giving voice to the whole People of God, precisely by means of the Bishops,” who are “guardians, interpreters, and witnesses of the faith.” From Assembly to Assembly, the Synod reveals itself as an eloquent expression of the “synodality” of the Church herself, in which the communion of diverse cultures is reflected. 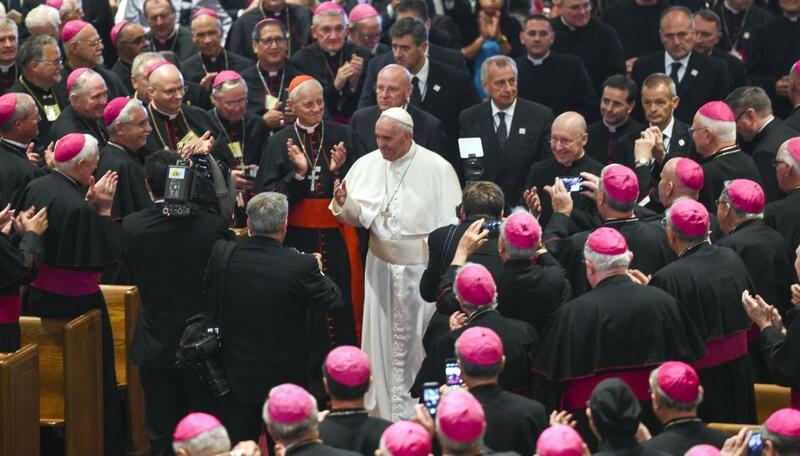 The Synod shows clearly the “profound communion” between the Pastors and the faithful, and between the Bishops and the Pope, which exist in the Church. Pope Francis expresses his hope that the Synod might, “in its own way contribute to the restoration, of unity among all Christians, in accordance with the will of the Lord.” By doing so, it can help the Church “find a way of exercising the [papal] primacy which, while in no way renouncing what is essential to its mission, is nonetheless open to a new situation,” as Pope St John Paul said in Ut unum sint.